Some messed up stuff has happened to me in kitchens. There was the time I stuck my finger into a hand blender to get out some cake mixture and then accidentally pressed the ‘blend’ button *faint*. Then there was the time I was cooking with some innocent looking baby peppers that turned out to be habanero chillies, which caused my hands to burn for a whole night. There have been countless spillages – an upturned bowl of clam pasta on our rug, a large tub of yogurt on my sneakers, the list goes on. And then there was last night when a large glass bowl exploded spectacularly in my hands as I was peering at it with great interest. See our kitchen is very small and there isn’t much work surface, so sometimes we use the parts of our stove that aren’t hot as work surface. Last night one plate in the front had a pot full of beautiful bolognaise sauce, which had been cooking for two hours, simmering away. What needed to happen next was the making of a large salad and cooking of spaghetti. So I took out a large, heavy glass bowl for the salad, but there was no space for it, so I put it on one of the back plates of the stove which was off. Then I ‘turned on’ the second front plate for making the spaghetti. Now, here is were the so-called complicating event (I’ve been reading my interactive narrative linguistics!) 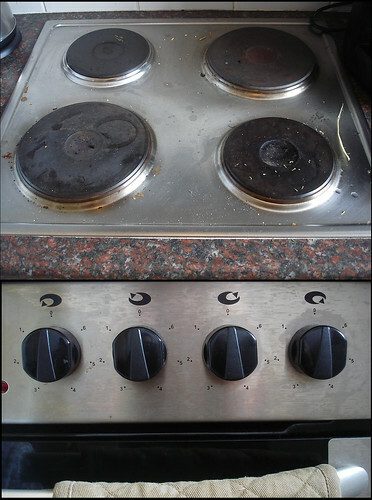 happened: the pictures/icons on our stove panel which tell you which knob turns on which hot plate are kind of ambiguous (see the picture below) and after over two years of using this stove we still sometimes turn on the wrong plate. This has led some minor incidents of melting spoons and uncooked pasta wallowing in room temperature water for ages before we realise that its plate’s not on. But not last night ooooh noooo, last night was special. can you tell which knob goes with which hot plate? I put on the kettle to boil water for the spaghetti and started washing lettuce, all the while, unbeknownst to me, the spaghetti pot remained unheated while that glass bowl perched on the back plate was getting hot hot hot. I turned back to the stove pour the now boiled water into the spaghetti pot, looked over at the glass bowl, picked it up and thought ‘mmm there seems to be a brown ring on the bottom of this bowl’. And then I put it *back* on the hot hot plate and went off to do something else. When I came back, I thought to myself ‘Sheesh! Why isn’t this water boiling yet?!’. This is when the little lights in my pinball brain started to bling faintly, I picked up the glass bowl again and looked at it real closely. I started remarking to Dave, who was standing behind me, how I must have put the glass bowl on a hot plate by accident and it now had a brown *PLOOOWWW* – that there bowl just exploded in my hands, I mean really exploded, loudly, spewing chunks of glass into every concievable corner of our tiny kitchen. There were no pieces in my fingers, it was all over the floor, on top of the fridge, in the coffee machine, all over the counters. But like so many of my disasterous stories there was some mercy (see this is how I know God assigned me a Special Forces Klutz Control angel) – that pot with the beautiful bolognaise sauce was closed and the only injury sustained was a teeny scratch on my wrist. The only real consequence was that we had to stage a complete kitchen clean before Luisa, Dave and I could get down to to the business of eating. As always when this kind of thing happens I was pretty much stunned for an hour after that repeating alternately ‘I can’t believe that happened’ and ‘Why do things like that seem to happen to me?’. So kids – hot glass cools down a lot faster than it heats up and this leads to big *KER PLOW*, don’t try this at home.